This is a perfect CD of music for everybody - for a variety of temperaments, for all ages and all occasions. It can be carefully listened to (being a CD which has been produced with much care) or appreciated just as background music, or by paying more attention to the music itself and to the vocals (addressing itself to all adult listeners). One could call the music "POP" (meaning "popular" music) based above all upon melody. 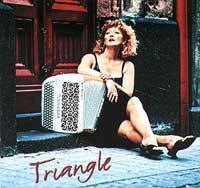 The melody is of great fascination and great communication always guided by the accordion or the great voice of Lydie. In some pieces (for example "Der vierte Mann"), the rhythm and modern setting seem to contrast the prominent melody. Personally I believe that these situations can produce something outstanding with much character. Lydie is a leader: all the art applies to her personality and the sound of her accordion (always equal and steady - as if being her voice), just as well as all her vocals in French language. This has surprised me a lot: as having at her disposal an instrument such as the accordion, Lydie always adopts her tone-colour, that becomes nearly her personal identity of sonority. One day I hope to be able to meet her personally in order to ask her about this choice. In this CD, there is also a good part dedicated to the Latin American inspiration; but also in these pieces the "Latin American" melody is in evidence but the base remains always that of a "song". A perfect CD of music for everybody - for a variety of temperaments, for all ages and all occasions.